It's so cold outside, that I watched random strangers, clean-business folk, approach cabs at red lights (cabs that had fares in them already) and try to talk their way into sharing a ride! eeeck. That's cold! So why is that I want ice cream during the coldest week on record in ten years? 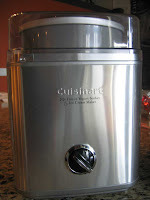 Maybe because I got a new ice cream maker for Christmas (the theme this year was Initial Matching- so I got "Monique's Magical Cuisinart (MMC), thanks Mark!) or maybe because I just like ice cream. So I actually took the base custard below, and made two ice creams from it because I couldn't decide on just one flavor. 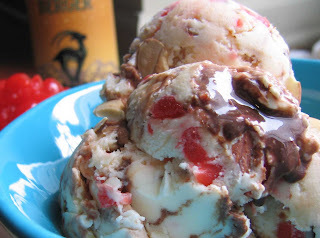 So feel free to use this only as the almond cherry swirl- (you may want to add a few more nuts and cherries) or check out the post for the Banana Caramel with Chocolate Covered Pretzels recipe and make both ice creams! With the chocolate swirl- if you just warm chocolate and use that- you will have hunks of hard chocolate in your ice cream. Which is okay sometimes, but this time I wanted a runny swirl (notice in the photo the runny chocolate swirl- that is straight from the freezer!) So check out how I made that below! Either way- you're going to love these even if the temperatures are below zero and you can't talk your way into someone else's cab- just stay home, pull on an extra sweater, eat ice cream and be fat and happy! Temper the hot cream to the egg mixture, add everything back to the pan on the stove. Cook over medium low heat until the custard is thick- and you can draw a line in the back of the spoon through the custard, and the line stays. Stir this constantly. When it's ready, strain the custard, then cool the custard in an ice bath and chill in the refrigerator overnight. If you add the chocolate in at this point- you'll just end up with muddy ice cream. So as you put the ice cream into a container for your freeze, add the chocolate swirl. Simply place a big scoop of ice cream in the container, and then drizzle it with chocolate. Now add another layer of ice cream and another drizzle of chocolate. Continue in this manner until complete. Mix the above with with a small wire whip. Add 1 Tbls of warm cream at a time, until you have a thick sauce. (depending the humidity- you may need only 1 tbls.) Cool. Drizzle on the ice cream as you pack it to freeze it.